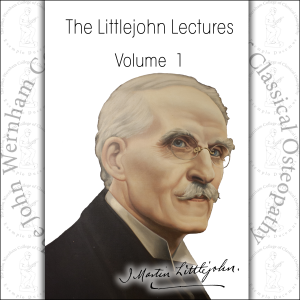 John Wernham wrote in his introduction to The Littlejohn Lectures Volume I “The transcription from the lecture room to the printed page is difficult. Any attempt to reproduce the intimacy of the spoken word to the reader from the silent book can only result in a conglomerate of repetition and the most unfortunate juxtaposition of uncontrolled sentences and ‘asides’ that, to say the least, make for difficult reading. The only solution to this dilemma is one of compromise between a mere verbatim record and a total reconstruction with some omissions and with some alteration in presentation where the meaning is obscure. However, in spite of this daunting prospect every effort has been made to preserve the great truths that are enshrined in the old manuscripts and to restore, to some extent at least, the atmosphere of the earlier years of academic osteopathy, without creating an excess of fatigue for the modern student.